Sweet Tooth sounds really interesting. I'm definitely going to check it out. Great pick! Loving the synopsis for Sweet tooth.It's like a romance/mystery.I'm now waiting on this also! Great pick! :) Sweet Tooth sounds like an interesting read! I feel a bit guilty admitting this, but I've never read McEwan. Perhaps this will be the book to cure me of that affliction! Sounds good. This sounds really good, nice pick this week. A new Ian McEwan! I liked Atonement, so I'll check it out! Sweet Tooth sounds like a great thrilling read. Great WoW pick. Thanks for sharing. 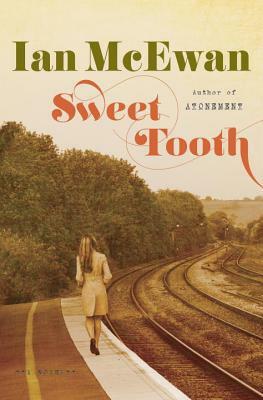 I haven't heard of Sweet Tooth before, but now it's on my TBR Radar! Jill, this sounds like a very nice read to me! Thanks for sharing, girl! This sounds fascinating! I like this cover better than the other editions. Thanks for sharing! I'll wait to see what you make of it, I find that with McEwan that I either love or loathe his novels. He's probably the only author who affects me in this way. Makes it difficult because I'm tempted to avoid his books altogether, and then I'm reminded of the ones I did like. I hadn't heard of this one so thanks so much for mentioning it --sounds good. This one looks really interesting. I haven't ever read anything by McEwan before, either. I'm not a huge Ian McEwan fan, so I'm on the fence about this one. Sweet Tooth sounds like a book I would like. Thanks for choosing it. Oh, I love McEwan's books and this one sounds fabulous! I would love to read this one too, great choice. Great WoW pick! I would love to read this book. Sweet Tooth sounds pretty amazing, I'm definitely going to have to check that one out! Thanks for sharing. Wow, that synopsis sounds great! I'm adding that to my to-read list! This would normally not be a book I would even think of reading, but the synopsis caught my attention in a big way. Thanks for sharing! I really like the sound of Sweet Tooth, thank you! I'd like to be apart of your Waiting on Wednesday posts. I’m digging the synopsis – good pick! Crumbs... Talk about coincidence. I've featured that on my WoW posting albeit with the UK cover. Please feel free to head over to my blog to take a look. This book sounds so great. I love Ian McEwan! Thanks for sharing and hosting Waiting On Wednesday! This is my first Waiting on Wednesday post! Awesome pick! I like the sound of it. Thanks for sharing! Waiting on a favorite author...again: Jasper Fforde. Good choice, I'll have to look into it. Sweet Tooth sounds like it will be an interesting book. Ooooh! I historical fiction and a romance. Nice choice! First time participating in the WoW posts. So excited! ARGH i thought i linked this morning but i hadn't tut tut lol. Sounds very interesting. Hope you enjoy it once you get it! Have a great week! Wow, Sweet Tooth sounds awesome. Thanks for introducing me to it! Sweet tooth looks like a fun read!! I will definitely add it to my tbr! Sweet Tooth sounds like an amazing read! I'll have to keep my out for it! Great pick! Hope you enjoy it and have a great week reading! love the title "In Between Days", and the syonpsis sounds interesting.